Low-ranking "new girl" chimpanzees seek out other gal pals with similar status, finds a new study of social relationships in the wild apes. The study is available online and is scheduled to appear in the July 2015 issue of the journal Animal Behaviour. Unlike most primates, female chimps are loners compared to males. "They spend about half their time alone or with dependent kids," said Duke University research scientist Steffen Foerster, who co-authored the study. 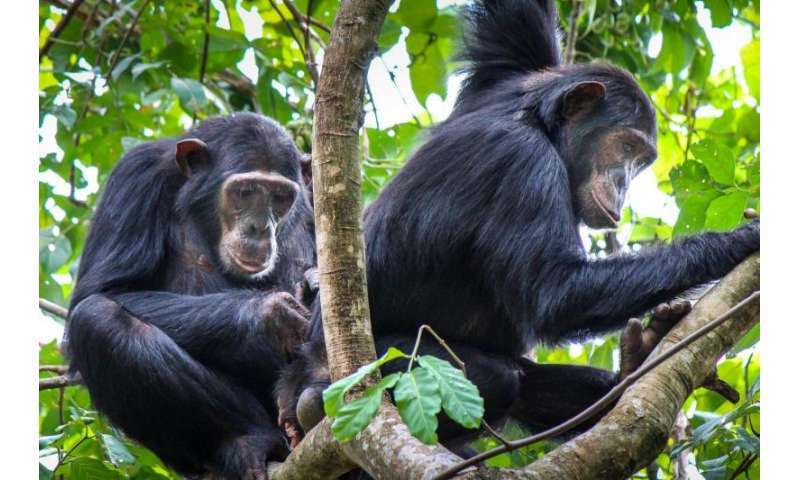 "Chimpanzee females' more solitary existence isn't that surprising given their dispersal patterns," said Duke evolutionary anthropology professor Anne Pusey. Male chimpanzees stay with the group they were born into their entire lives, forging strong social bonds with other males. Many females, on the other hand, leave their families behind and strike out on their own to join new groups. Despite their reputation for being aloof, recent studies suggest that some pairs of female chimps hang out together more than others. But whether these females actively seek each other out, or merely cross paths by chance because they haunt the same spots, was unclear. "If two people live close together they might see each other often at the grocery store, for example," Pusey said. "But the question is, do they also go and have coffee?" To find out if some females forge stronger bonds than can be explained by chance encounters or range overlap alone, Foerster, Pusey and colleagues analyzed 38 years' worth of daily records for 53 adult females in Gombe National Park, a 13.5-square-mile park in western Tanzania where Pusey began working with Jane Goodall more than 40 years ago. Over the decades, the females were spotted in more than 600 female-female pairs. For each pair, the researchers measured how much their ranges overlapped, how much time they spent together and how often they groomed each other, a chimp's way of making friends and cementing social bonds. The team found that some female-female relationships are tighter than others. Not surprisingly, mothers, daughters and sisters formed the strongest bonds. But among unrelated females—which made up more than 95 percent of the twosomes they studied—low-ranking females were more likely to seek each other out than females from other social ranks. The researchers are still working out whether the low-ranking pairs are true buddies, friends of convenience or merely acquaintances. "It doesn't necessarily mean that they like each other," Foerster said. "The lowest-ranking females are the newest to arrive. When a female migrates into a new group, she starts at the bottom of the social ladder. It may be that they're not really that into each other, but that they need to tolerate being in the same space," he said. Or it could be that low-ranking females team up for support against harassment from higher-ranking females. "The resident females don't make it easy for the new females—they chase them around," Pusey said. Female bonding also could help offset the disadvantages of low rank by giving subordinate females greater ability to compete for food, or additional pairs of eyes and ears to help spot predators. Females with juvenile sons were also more likely to seek each other out, the researchers found, presumably to give the young males a start on developing the social skills they'll need to thrive as adults. The study is part of a larger field of research on the importance of social networks for health and survival in primates and other animals, including humans. The team's next step is to examine the stability of female-female bonds over time. "If they endure despite other changes, 'friendship' is a more likely interpretation," Foerster said.